The Washington Post reported that North Korea continues to develop ballistic missiles. Will Trump use these "proofs" as a means of exerting pressure on Kim Jong-un, or will the Democrats through the secret services and the media try to derail the agreement between the US and the DPRK? A month after the historic meeting between the presidents of the United States and the DPRK in Singapore, the media are seeping into messages that are contrary to the outcome of the Singapore summit. Then Donald Trump and Kim Jong-un agreed on the normalization of bilateral relations and the denuclearization of the Korean peninsula. The American edition of The Washington Post, citing intelligence data, reported that the DPRK is developing intercontinental missiles at a plant near Pyongyang. Tom itself, where the first intercontinental ballistic missiles of North Korea were produced. American spy satellites took pictures showing the vehicles entering and leaving the Sanmdong factory site. This was reported to a British agency Reuters by an American official, noting that it is impossible to determine from photographs how far the construction of missiles went. According to The Washington Post, we are talking about two intercontinental ballistic missiles that operate on liquid fuels and are capable of reaching the territory of the States. Dealmaker-in-Chief boasted too soon that North Korea is not messing with their old missiles anymore. Rather they are building new and better missiles. 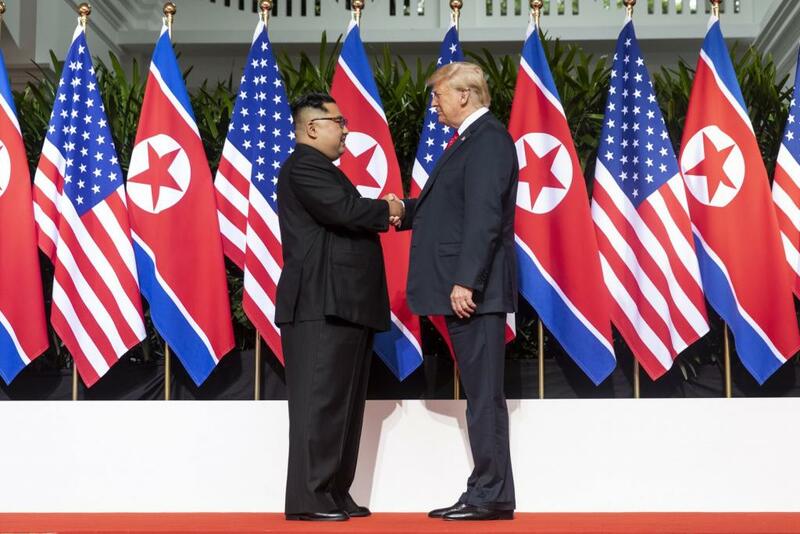 So Rocket Man did not go away for a photo op with Orange Man. Nope. Trump has simply made matters worse! The fact that North Korea does not stop its nuclear missile program is not a secret for the White House. Back in late June, US officials, also referring to intelligence, noted that the DPRK increased the production of fuel for nuclear weapons. Recently, Secretary of State Mike Pompeo reported this to the Senate Foreign Affairs Committee, noting that Pyongyang had promised to get rid of the banned weapons. Who is to blame: Trump or Democrats? The dissemination of reports on the development of the DPRK's missile capabilities in the US media, which can easily be a disinformation, cloud the summit in Singapore, which is one of Trump's most important achievements as president, albeit without a signed deal. Such events opponents of the normalization of the situation on the Korean peninsula can use to emphasize the ineffectiveness and unreality of negotiations with Kim. On the eve of the midterm congressional elections, failure at the 38th parallel is a blow to the reputation of Trump and his fellow Republicans. The second option is less likely: the head of the White House is trying to increase pressure on Pyongyang to bargain for the US more favorable terms in the future agreement. This could be the creation of preferential terms for American companies, the "squeezing out" of China and the preservation of American forces in South Korea. The last moment is one of the most important for Pyongyang, which believes that denuclearization should extend to the entire peninsula. There are six months to go before the Congressional elections. This period is sufficient both to prevent rusting of the negotiations between the US and the DPRK, and to finally bury them. In Pyongyang, as in Tehran, it is understood and therefore, without wasting time, work directly with Seoul. On the day when The Washington Post distributed defamatory North Korean images, for the first time in 10 years the North and South Koreans met in the border town of Panmunjom. Will Trump turn DPRK into an “economic rocket”?